7. Patent pain: barriers to intellectual property protection. 8. Regulatory pain: challenges in policy, regulation, and law. The strongest parts of the book, however, are those chapters that examine innovation fatigue factors that are tied to organizations. These chapters—which also include examples from the touring company of The Lion King—offer the most important lesson in the book: “Employees can be paid to offer their time and energy to the corporation but in spite of what might be on a contract, they will only share their best ideas when they feel personally motivated to do so.” This fact is at the core of the challenge that many organizations face. It is expressed in phrases like “if only ____ knew what ____ knew” (fill in the blanks with your company or organization). These chapters are well worth reading and rereading. 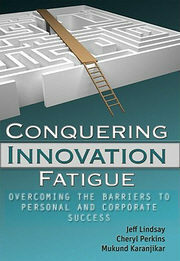 The book continues its examination of organizational sources of innovation fatigue by addressing the conflicting commandments to “get close to your customer” and “seek white space.” Although many consultants urge corporations to get closer to core customers, the authors show that, if this isn’t done with caution and a healthy dose of skepticism, a company’s best customers can become a source of innovation fatigue. The field of consumer electronics is rife with examples, and the authors pull together a number of classic stories of success arising from vision, not customer insight, notably, the Apple iPad. The third class of innovation fatigue factors, external factors, is largely a result of laws and regulations. Most readers would agree that, in classic Porter fashion, that these external factors must be considered in any innovation strategy. It is less clear that they are sources of innovation fatigue. Nonetheless, this section of the book provides a useful survey of innovation challenges ranging from weak intellectual property regimes to the challenges of working with diverse university policies. The book also includes chapters on culture, metrics, and government policy. It closes with a section offering “Further Guidance” and a list of 15 specific recommendations on how individuals, corporations, and policy makers can cooperate to overcome innovation fatigue. The organization of the book is at times puzzling; for reasons that are not obvious, chapter 2 detours through an alternative to the funnel model of innovation that, although it’s an interesting idea, doesn’t at all fit the narrative of the book. However, the book offers a compelling discussion of the factors that lead to innovation fatigue that merits attention, particularly the discussion of organizational factors. The book is further recommended as a “quick read” that lends itself to a cross-country or transoceanic plane ride. The reader will arrive at his or her destination with some fresh insights or supported convictions in the field of innovation management.